Home Ceramic cookware Is cast iron too heavy? Try the Emile Henry Dutch oven. The Emile Henry Dutch oven, who says you need cast iron when you use Burgundy clay. If you are looking for a Dutch oven but are put off by the weight of cast iron your not alone. As much as we love our cast iron, we are first to admit the bigger pots can be too heavy for many. This is where the Emile Henry Dutch oven fills the gap perfectly. Their Dutch ovens are made of clay and therefore a lot lighter to move around. Yes they are pretty cute too. If you’re looking for an alternative to cast iron then the Emile Henry Flame top Dutch oven could be just the ticket. It can be used on most stove tops and of course your oven. However please follow the preheat instructions. I’d go for the 5.5 quart it’s a great size for Dutch ovens and the 4.2 is great for couples. See the link to Amazon below. Why you need a Emile Henry Dutch oven. Dutch ovens really are useful. They really are versatile, Dutch ovens can braise, bake, roast and are used for stovetop cooking like a regular pot. Its functionality makes it a kitchen staple and due to its versatility, you should look for a Dutch oven or stewpot that is of the highest quality. Emile Henry has a range of dutch ovens/stewpots and their Flame Round Dutch Oven/Stewpot is a favourite. It is not hard to see why this pot has resonated with many cooking enthusiasts. Just like Staub and Le Creuset, Emile Henry make the finest Dutch ovens. Except Emile Henry do theirs in clay. Emile Henry are a French cookware maker that still make their Dutch ovens or cocottes as the say in France since 1850. Needless to say they know a thing or two about making pots. Best thing is they still hand made in France preserving their rich cultural heritage and for just a little more than ones massed produced. 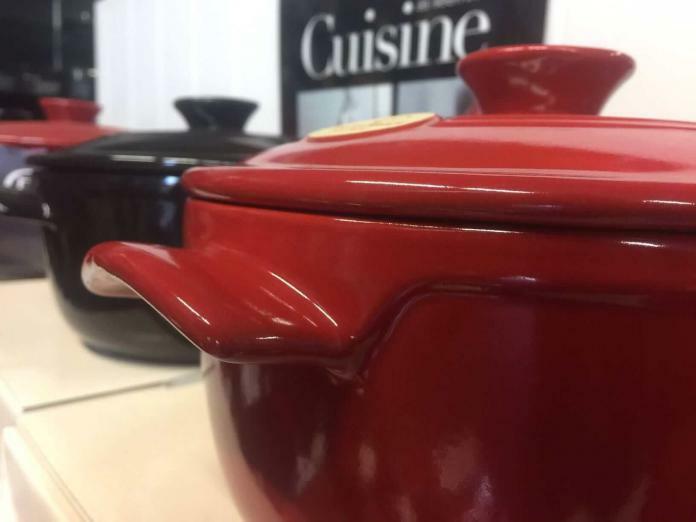 Here are some great reasons to choose Emile Henry ceramic cookware. Have a gas or electric stove top? Your Emile Henry flame top Dutch oven can go on your stove too. You can use you Dutch oven on your electric and gas stove top just like your pots and pans. With not metal to conduct heat in the pot your Emile Henry cannot be used on induction cooking. Your Emile Henry pot uses only natural glazed clay. It is one of the oldest, most natural ways to make wholesome meals. 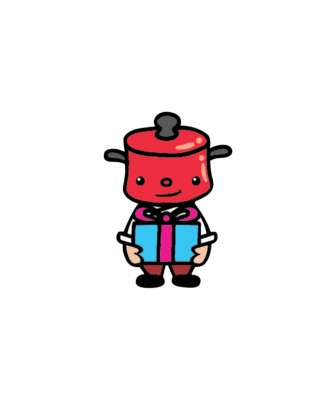 Besides using it on your stove, you can use the Flame stewpot to bake desserts and other delicious dishes in the oven that will make you gravitate towards the kitchen whenever you get home! The Flame Round Stewpot is 11 inches in diameter and holds up to 7 quarts making it a great choice to cook family meals in. Emile Henry builds their cookware to last. 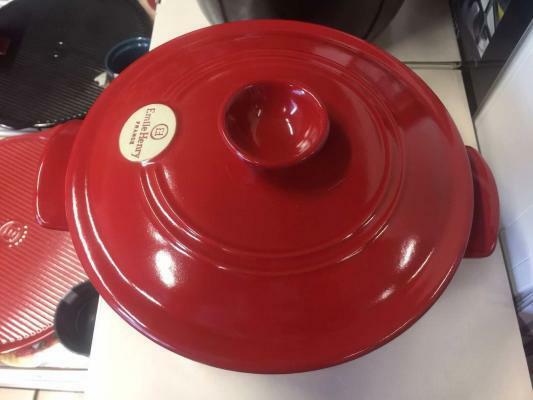 Like all other high-fired ceramic cookware from Emile Henry, the Dutch oven can withstand extreme temperature. Your Dutch oven can from the freezer and into the oven or your stove. You can even use it in the microwave. Now thats something us cast iron fans can’t do with our cast iron. You can use the stewpot to simmer food to perfection while retaining its natural flavour, aroma and nutrients. Meat, vegetables, desserts, fish, soups, pot roast and stews you can all cook in a ceramic Dutch oven. The glaze besides being really attractive also helps in preventing food from sticking to the bottom of the Dutch oven which makes it unnecessary to coat the bottom with too much oil making for healthier meals. It’s not going to be as non-stick as bare cast iron but it’s going to be a lot easier to clean than stainless steel cookware. Pros of Emile Henry Flame Dutch Oven/Stewpot. The ceramic Dutch ovens are safe to use on stovetops, grills, microwaves, oven and broiler. It can go directly from freezer to oven/microwave due to its ability to withstand thermal shock. It ensures healthy meals due to low, slow and gentle cooking, requirement of minimal fat to grease the bottom and it doesn’t get more natural than clay. The latter ensures that vitamins and nutrients in your food are retained. The stewpot is made using natural products such as non-treated clay, sand and filtered water ensuring non-toxic, light, non-porous and high resistance (HR) ceramic. The pot is resistant against color fading, thermal shocks and mechanical shocks extending its durability. Ceramic Dutch ovens do not react to acidic food like bare cast iron. Cons of Emile Henry Flame Dutch ovens. More expensive than Chinese made cookware. Ceramic pots can chip more easily than enameled cast iron. The Emile Henry Dutch oven is the best alternative to cast iron. 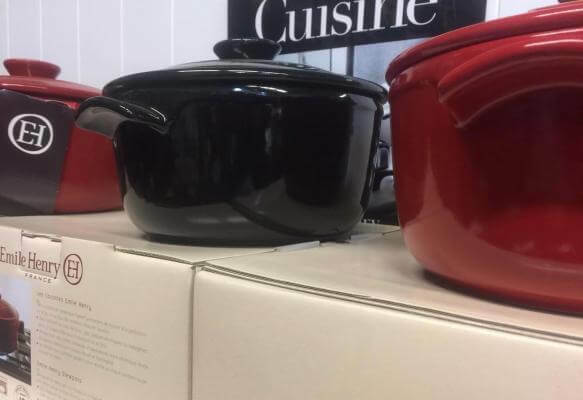 If your looking for a ceramic Dutch oven then look no further than Emile Henry. They really amazing ovens that are lighter than their cast iron counterparts. 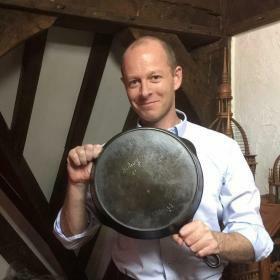 They also take great pride in their cookware, they still make their cookware using Burgundy clay and still use traditional methods to make their cookware. Emile Henry also roughly check each oven for any imperfections for it leaves the factory. If we still haven’t convinced you of the benefits on a ceramic Dutch oven? Well we have more information on cast iron. If you are familiar with our site then you will know we are huge cast iron fans. Here are some interesting articles the Staub cocotte and the Le Creuset cocottes. They make amazing enameled cast iron with many of the benefits of a ceramic Dutch oven. Lodge manufacturing also make an amazing oven although we would recommend their bare cast iron over their enameled products. No one currently does enamel like the French. Natural clay it doesn’t get any more natural. It also happens be lighter non-reactive and safe to use in the microwave. If your’e looking for a ceramic Dutch oven without the weight of cast iron, can go from freezer to stove. Transfer your pot to fridge and back into the oven the next day. The natural clay ceramic Dutch ovens are a great bet and none to it better than Emile Henry. Previous articleWhat makes the Le Creuset Dutch oven so special? Next articleWhat are the benefits of ceramic cookware? Lets find out.